Amira Cruise was established in June, 2016. With the motto of comfort and convenience for tourists while travelling in Halong Bay, the modern-style rooms were designed with best facilities and luxuries for tourists. Amira cruise was launched to meet the travel needs of the families, who have always loved and desired a private atmosphere and cozy. 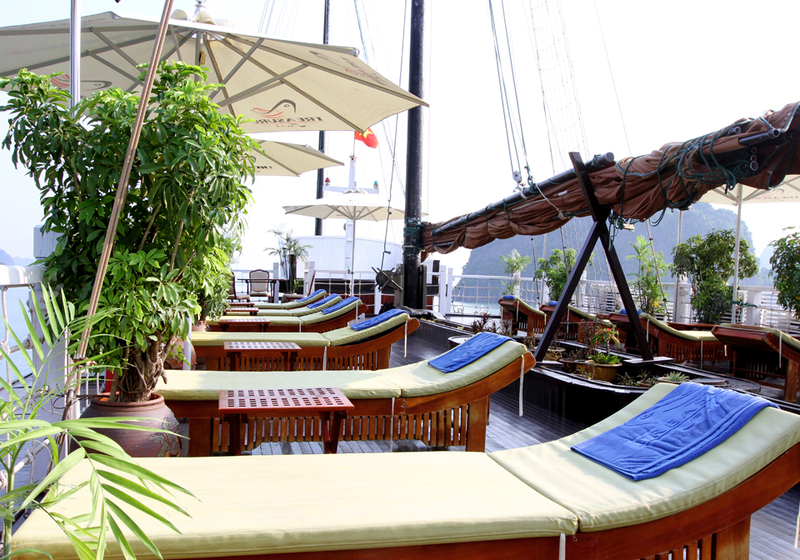 Therefore, coming to Amira Cruises, tourist will be welcomed warmly and feel close as home. There are two family rooms and one double which is an ideal for young couples in honeymoon time or couple wanting to review the old memories. Family rooms with ample space are a perfect combination for parents and children. With an area of 30m2, it is a best choice for families of both financial and services. We are committed Amira Cruise is not only a cruise but also the second house that giving tourists the comfort and the finest amenities. 08:00: Hotel pick up. Drive to Ha Long city. 12:45 13:30: Enjoy welcome drinks and follows by cruise manager safety briefing. One of the biggest and most beautiful grottos belonging to Bai Tu Long Bay. Bring your phone, camera to take pictures, please! 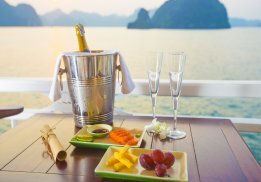 18:00 – 19:00: – Enjoy “Cooking class – making spring rolls” and “Pruning fruits and flowers” while the boat go to Cong Do – point to stay overnight. Enjoy “Happy hour” with “Buy two get third one free” applied from 18:00 to 19:00. 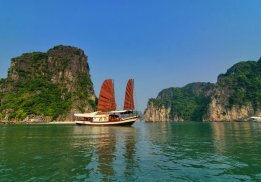 Listen and understand about the history, geography, custom of Ha Long Bay by watching video at restaurant. Sightseeing and explore outside the bay is following under the sail. But you must pay for this service about 100 usd. 12:00 – 12:00: Return from Ha Long to Hanoi. Notes: The entire schedule is made to be changed in regards with the weather condition permits.